West River bank, North of Mission Rd. 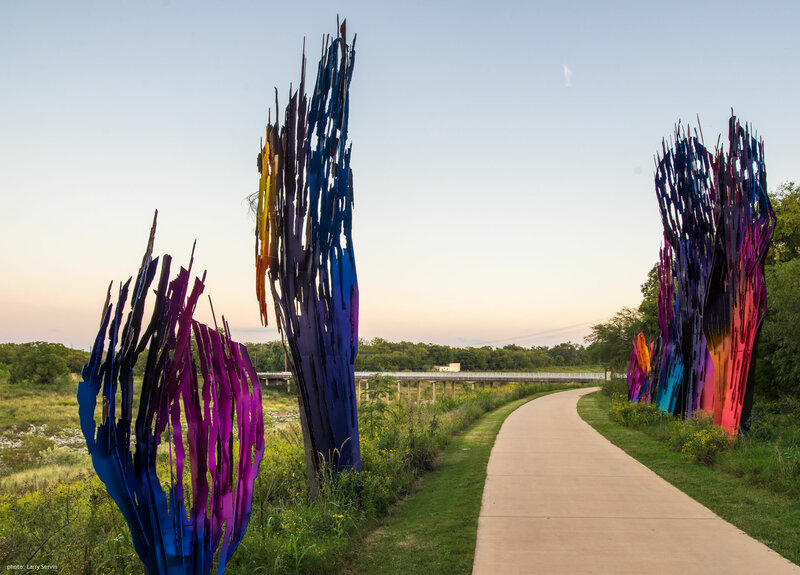 This monumental installation connects the River and Mission San Juan, serving as a portal between the two; named “Whispers” because the pieces “speak” to each other in their movement and color. Arne Quinze was born in 1971 in Belgium and lives and works in Sint-Martens-Latem, Belgium and Shanghai, China. He has been creating large and small sculptures, drawings, paintings, and large-scale installations worldwide for over two decades. Smaller works, sketches, and drawings are the basis and research for his large installations. Quinze began working as a graffiti artist in the 1980’s, but never completed a formal art education. For Quinze, every city is an open air museum. Best known worldwide for building enormous and surrealistic public art installations, Quinze focuses on the recurring themes of social interaction, communication, and urbanism. What drives him is “the belief in the possible realization of an idealistic society where all individuals communicate and interact.” He aims to bring people together and push them into a vigorous dialogue. In every culture Quinze comes across, he unravels physical processes, drawing inspiration from the “overwhelming optimism of our humanity.” His installations are built to provoke reaction and to intervene in the daily life of passersby confronted with his sculptures. In his urban vision, communal activities flourish and social cohesion is the norm. Always seeking inspiration from the direct environment in which his work is placed, Quinze aims with “Whispers” to connect and draw attention to the unique flora that characterizes the San Antonio region. 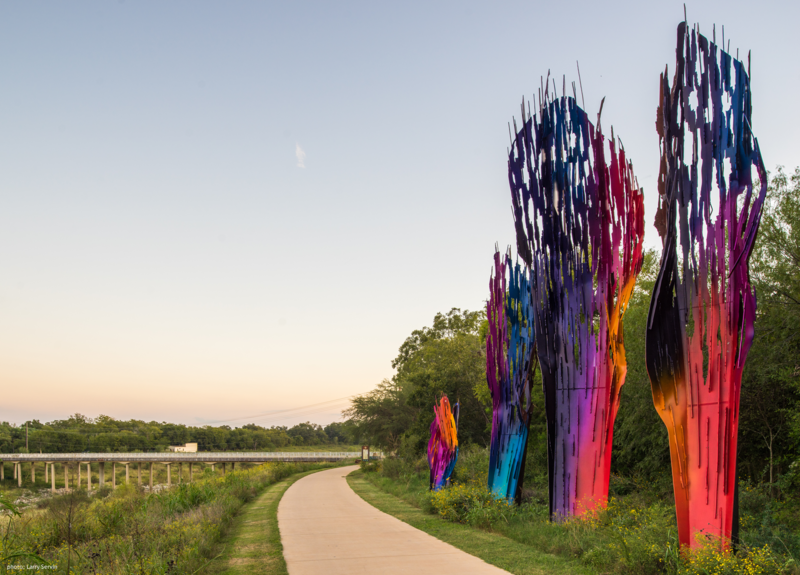 As such, his multi-dimensional sculpture references abstract connections to the mesquite, small oaks, and pecan trees native to the area. The color scheme of “Whispers” is a blend of Quinze’s signature fluorescent red-orange and a beautiful mixture of blues and purples referencing local wildflowers, such as the bluebonnet. This wonderful new addition to the Mission Reach will be located along the west bank of the Mission Reach segment of the River, just north of the Mission Road bridge.